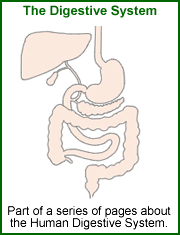 To read about other parts of the digestive system, use the links on the left-side of this page. These are just short notes to describe amino acids. Breakdown of the proteins in the body yeilds amino acids. Some of these amino acids can be synthesised by the human body but Essential Amino Acids must be obtained from protein in the diet. For more detailed information see the main study page about amino acids.